For Busy Families Who Want to Transform Their Health and Home Quickly and Easily! Do you want to get healthy but aren't sure if your family will change their unhealthy habits? Do you struggle with information overload when researching health topics? Have you tried making changes in the past but quit because they were too difficult to maintain? Do you think healthy food is expensive but choose boxed and pre-packaged foods because they cost less? Do you want to cook more from scratch but don't feel like there's enough time in the day to do it all? Do you want to have a cleaner, toxic-free home but don't know what chemicals are bad and which are okay? Every day people try to get healthy, yet 9 out of 10 times they fail. Why? Are they not trying hard enough? Are they not spending enough money? Enough time working on the changes their making? No - They take on too much. Just like marathons are run one step at a time, a healthy lifestyle is created with one small, practical change at a time. But a "healthy lifestyle" is a very broad concept. It includes what you eat to how you sleep, the lotion you use on your skin and the shampoo you use to wash your hair, even the containers you store leftovers in and the cleaner you use to scrub the counters. With so many changes to make towards healthy living, how do you know where to start? 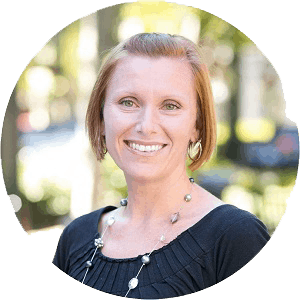 My name is Tiffany and besides being an ordinary mom with 2 kids, holding a full-time career as CEO of an online business, I'm also a healthy living enthusiast, a blogger and the creator of the hugely successful online eCourse, Grocery Budget Bootcamp. This program alone has helped thousands of men and women positively change their health and their budgets. In fact, the same insights and methods found inside are the reasons why my husband and I are able to keep our grocery budget at $330 each month for our family of four. After trial and error on failed tutorials, wasting time and money and energy on changes my family hated and spending countless hours wading through information on natural living, I quickly discovered what does and doesn't work. I know first-hand what it's like to struggle with wanting to feed my kids healthy food and not being able to afford it; needing to take care of myself but there not being enough time in the day to do it; wanting to make changes in my family's health yet be afraid to mess it up at the same time. What I'm about to share with you worked for me and many others. That's why I'm confident it can work for you. You are welcome to start your own search online, but believe me - there is a lot of misleading information being shared and it's overwhelming to weed through the junk. By the time you get through it, you'll be more confused than when you started and you'll want to give up before you even begin. That's why I created the most comprehensive guide to getting started with frugal natural living, so you can navigate through the concepts, learn simple yet effective steps to transform your health, your home and your environment - ultimately giving you positive changes that last. I've put together a 180 page, proven life-changing eBook that can hold your hand as your transition to natural living and make significant, healthier changes in just one month. I've gone through all the hard work of testing it out and sharing essential facts, recipes and everything you need to get started, so you don't have to learn by trial and error. And the most remarkable part of this guide is that it shows you how to do it without spending a fortune. This means that anyone can get healthy, regardless of their income or budget. The unique challenges in this guide offer simple, straight-forward ways to make an impact in your life in just 15 minutes per day. Every challenge comes with 3 difficulties levels, allowing you to make changes now as a beginner and to continue making changes as you get more comfortable with topics and determine what areas you want to grow more in. From dental health to skin care, laundry to kitchen counters, ingredients to avoid in food and in lotion, cooking from scratch to eating seasonally, changing the way you shop and how to take medicine, creating a budget and making more money - this is a one-of-a-kind book contains 90+ challenges and simple truths about healthy living that will transform your home. But I didn't leave you hanging with what to do. I've given you every resource I possible could explaining HOW to make it happen. 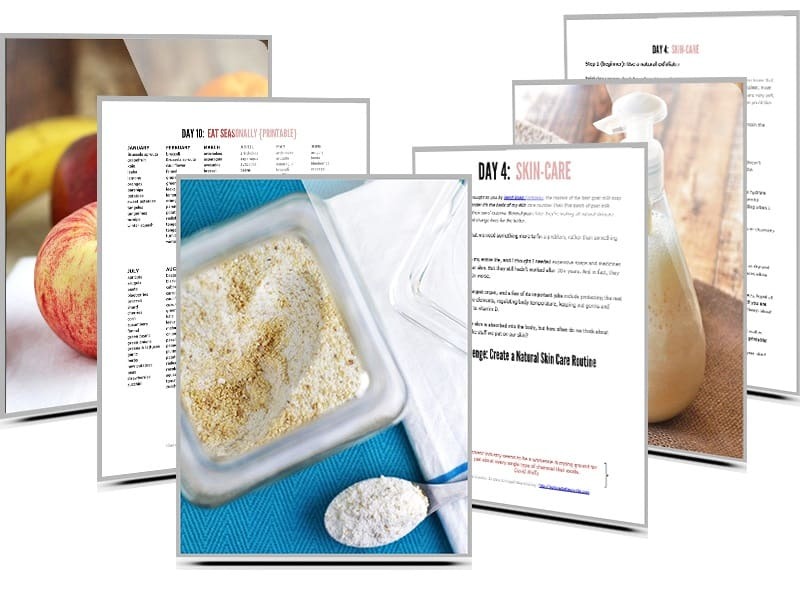 There are 25 delicious, mouth-watering recipes that your family will love, plus 9 DIY step-by-step tutorials walking you through how to ditch toxic household products and replace them with your own homemade version that works just as good, if not better. 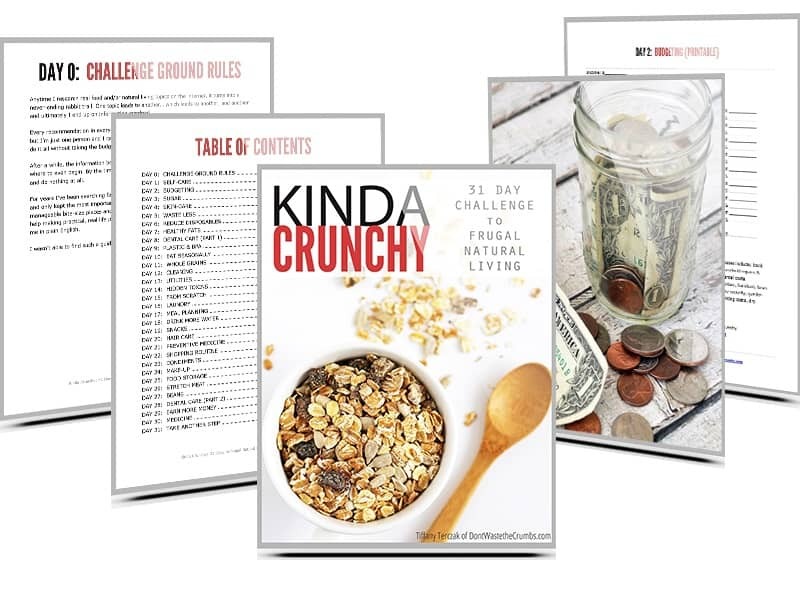 I've backed up these challenges with research and it's included in the book so you're not only making an amazing transformation in your home, but you know WHY you're doing it. Thank you, thank you, thank you. I was a bit skeptical at first but I am now a believer. Some of the challenges I was already doing. Some I knew I needed to work on. Some never occurred to me. Most, I have put into practice. Getting rid of shampoo and conditioner that contained chemicals was a big one for me. The natural product I am now using is working even better than what I had been using and the savings is significant! I can't imagine you outdoing yourself but am looking forward to your next challenge! Thank you for a great challenge! Wonderful, simply-presented resources to live healthily & simply. I'm loving the printable option too! I downloaded the book and couldn't stop reading it. Having everything in one place to refer back to is very helpful. It is well written, easy to understand, and flows easily... Of course, the info is just great. Thanks so much for taking the time to write this and put it together. It will be one of my go-to books and I plan to share it with a few friends! I purchased Kinda Crunchy just a few days ago. So far I am LOVING IT. It is a huge eye opener to see the different types of products and how you can just make simple changes that will change your life. Your book is one of the best books I have ever encountered because the way you set up the challenges and how you break it down for people who are literal beginners at this. It makes it that much easier to obtain. 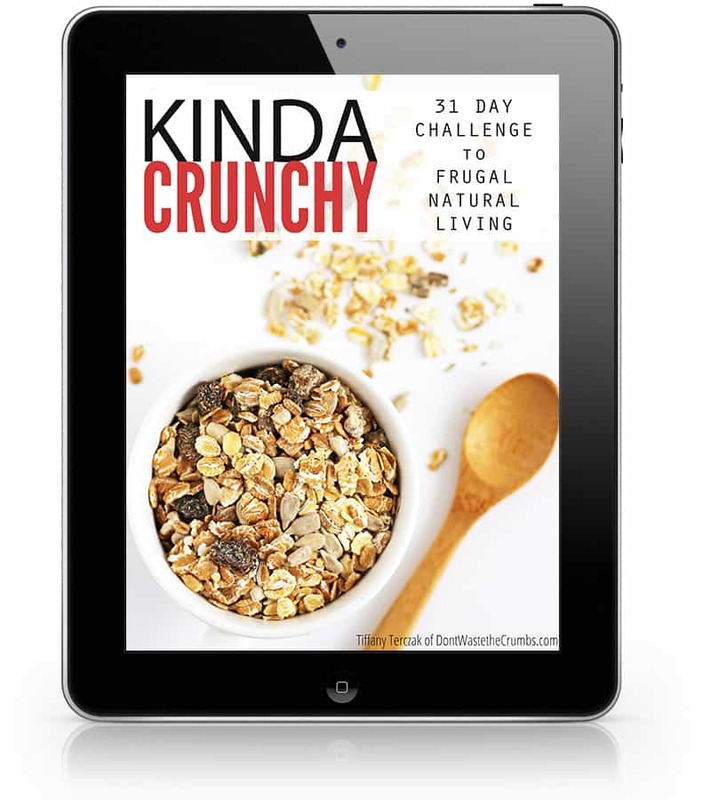 Kinda Crunchy is amazing, very well setup, and just what you need to change your life! I am so excited to start! It's Your Turn to Reap the Benefits. Buy the eBook Today! Start today making real life changes to your health that aren't the latest fad. Implement simple routines that easy for the whole family to use, both now and in years to come. There's no gimmicks. No "do this and you'll magically be healthy". Getting healthy takes work and time, but you don't have to go it alone. That's what I did and I don't want that for you. Then go though the guide again, following the intermediate steps. You'll build upon the simple truths you learned as a beginner and you'll grow even more, realizing that healthy living is not out of reach. Then go through the guide AGAIN, following the advanced steps. You'll challenge yourself to think outside the box, incorporating changes you never thought possible and lead your family on a well-established road of healthy bodies and a healthy home. Keep this eBook for reference when you fall down and don't know where to start again. Use the challenges as inspiration to keep making changes, to keep taking small steps. Go ahead - order now while you're still thinking about it! I am confident that your life will be transformed with this eBook once you start working through the daily challenges inside. I have no doubt that in less than one month, you'll feel better, be less overwhelmed and be more confident in your steps towards good health. PS - Don't put off your health until "someday" because "someday" will never come. Now is the time for you to take your health into your own hands, but don't do it alone! Buy this eBook and get hold-your-hand guidance and encouragement. You'll be taking steps that will help you and your family live your best lives possible from now and decades to come.